In this article, I have explained constructors in C# and their types with examples. 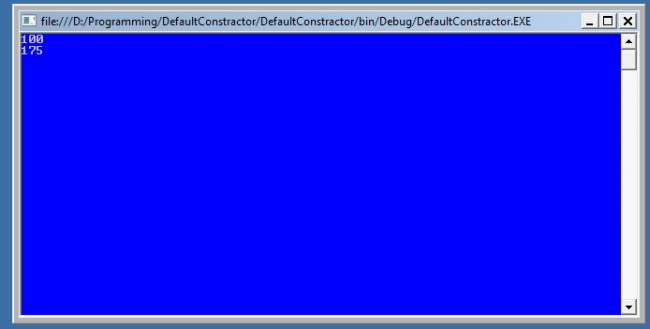 A C# Constructor is a method that is automatically invoked when an instance of the class is created. 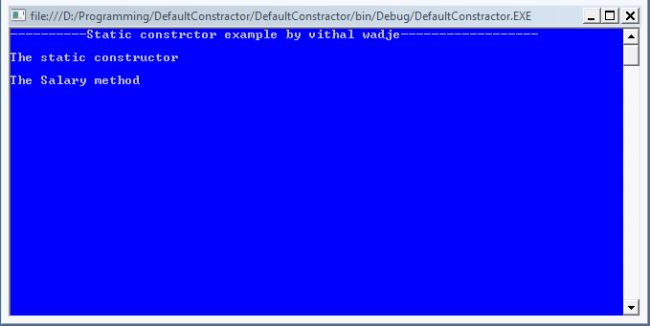 What is a constructor in C#? A special method of the class that is automatically invoked when an instance of the class is created is called a constructor. The main use of constructors is to initialize private fields of the class while creating an instance for the class. When you have not created a constructor in the class, the compiler will automatically create a default constructor of the class. The default constructor initializes all numeric fields in the class to zero and all string and object fields to null. A constructor doesn't have any return type, not even void. A static constructor can not be a parametrized constructor. Within a class you can create one static constructor only. Now, let's see each constructor type with example below. All numeric fields in the class to zero. All string and object fields to null. A constructor with at least one parameter is called a parametrized constructor. The advantage of a parametrized constructor is that you can initialize each instance of the class with a different value. The constructor which creates an object by copying variables from another object is called a copy constructor. The purpose of a copy constructor is to initialize a new instance to the values of an existing instance. The copy constructor is invoked by instantiating an object of type employee and by passing it the object to be copied. Now, emp1 is a copy of emp2. Let's see its practical implementation. public employee(employee emp) // declaring Copy constructor. public employee(string name, int age) // Instance constructor. employee emp1 = new employee("Vithal", 23); // Create a new employee object. employee emp2 = new employee(emp1); // here is emp1 details is copied to emp2. When a constructor is created using a static keyword, it will be invoked only once for all of instances of the class and it is invoked during the creation of the first instance of the class or the first reference to a static member in the class. A static constructor is used to initialize static fields of the class and to write the code that needs to be executed only once. Now let's see it practically. One use of a private constructor is when we have only static members. Once we provide a constructor that is either private or public or any, the compiler will not add the parameter-less public constructor to the class. Now run the application. The output is as follows. If you uncomment the preceding statement that is commented in the above program then it will generate an error because the constructor is inaccessible (private).